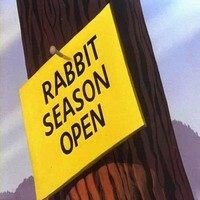 Rabbit Fire Description: Rabbit Fire is a 1950 Looney Tunes cartoon starring Bugs Bunny, directed by Chuck Jones and written by Michael Maltese. 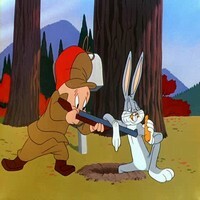 The short, also starring Daffy Duck and Elmer Fudd, is notable for being the first film in Jones' "hunting trilogy"â€”the other two films being Rabbit Seasoning and Duck! Rabbit, Duck!. 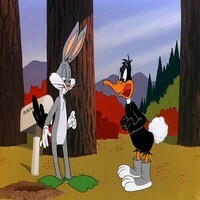 It is also the first film to feature a feud between Bugs and Daffy. Produced by Edward Selzer for Warner Bros. Cartoons, Inc., the short was released to theaters on May 19, 1951 by Warner Bros. Pictures and is widely considered among Jones' best and most important films. Terrace woo hoo. if only it vould work.